New luxury 2 storied beach house across the road from the beach (100m to the water). We have all the comforts of home with all modern facilites. We have plenty of space including a games rooms with pool table and table tennis table. Upstairs is the Lounge, Kitchen, Dinning room, Master bedroom and ensuite. All living areas upstairs have stacker doors that lead out to a great deck to maximise outside dining which includes an 8 seater outside dining table and Gas BBQ. Downstairs is 3 bedrooms, Bathroom, Separate Toilet, Laundry and Games Room, which flows onto another deck. This is the perfect place to relax and unwind. 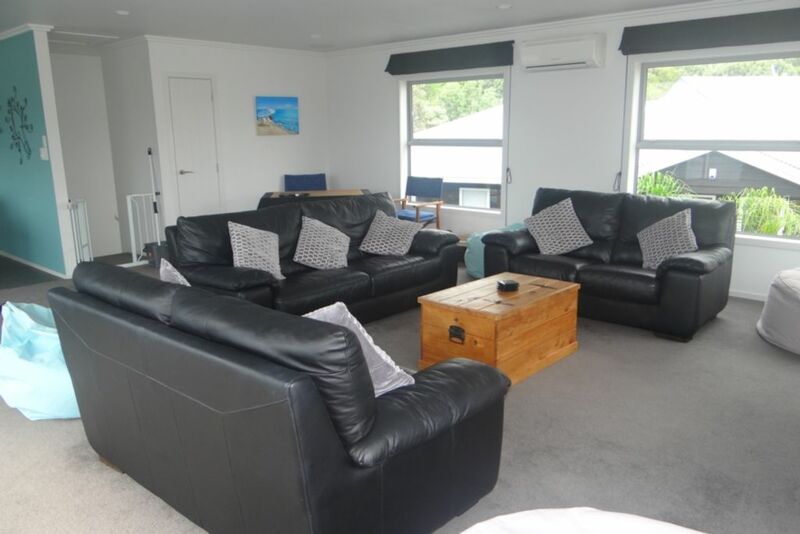 Close Proximity to the Boat Ramp and local cafe. Short walk to Anzac Bay. Please note that all long weekends are a 3 night minimum except for Easter weekend which is a 4 night minimum. Please note that a cleaning can be arranged at an additional cost. -House is to be cleaned, vacuumed and left in the same condition as it was found. -You will need to supply all your own sheets, pillow cases, towels, tea towels etc..
-Our neighbours and our neighbourhood are very important to us. Please remember to be considerate to the neighbours, parties and functions are strictly forbidden. Games room which has pool table and table tennis table. Lovely property with everything we needed. Good location close to the beach. Loved the games room. Spotlessly clean and quality chattels. Very comfortable beds. Perfect location with a path to the beach right in front of the house. Short walk to the campground and across to Anzac Bay. A great holiday spot! We hired this holiday home for our Christian Retreat Weekend. It was perfect for us. Lots of space and in a quiet location. Thank you. We rented this holiday home for our daughter's caregivers as we have our own place nearby. It was perfect and very spacious, we were able to move back and forth between the two properties. Well set up with master bedroom upstairs and three other bedrooms, bathroom and games room downstairs. Anyone would be happy with this property. The only negative was that after our stay the owner claimed we didn't clean it to her standard (it was thoroughly cleaned in our opinion) and that the neighbours advised her we had extra guests to stay (not the case, we had dinner there and walked home at 10pm). I think if you rent this property it would be best to organise professional cleaning with the owner in order to meet their very high standards and to be aware that the neighbours watch you, not a nice feeling to discover after the fact.